A lesson in humility. Princess Emma wants everything to be perfect for her tea party, but only God is perfect. Just when her guests arrive, everything seems to go wrong. How will Emma fix it? This Level-One I Can Read teaches girls what it means to be a princess for the true King. I have a six-year-old daughter who is the epitome of the average and happy first grader. When she came home from school today I told her that I had a book for her to read. When I showed her the book she said “Yeah! I love these books!” What a great way to start. We call our little girl Princess Wiggles of the Realm of Dirt Dirt. I really should write a post about how that nickname came about. Anyway, this story was perfect for her. Her attention was focused (not usually the case, hence the wiggles in her nickname) and she wanted to finish the book. She didn’t leave it partway through. An excellent way to finish. This is the first I Can Read! book that I have had for my children with a Christian lesson. I will look forward to having more. The message is simple but it is positive. 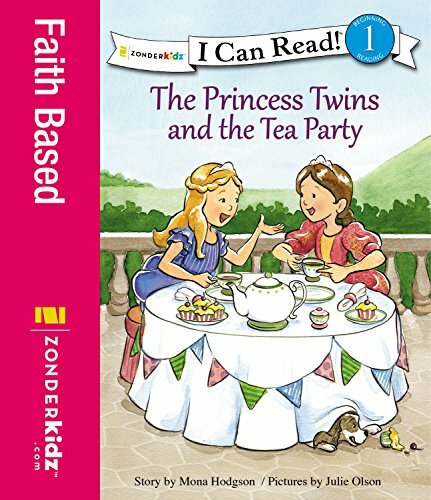 In The Princess Twins and the Tea Party the lesson is that only God is perfect. A great lesson for us all to remember. Your little girl will love The Princess Twins and the Tea Party. If you have as much fun listening to your child read it to you as I did then you will be very blessed indeed. A daughter, sister, wife, mother, and grammy, Mona Hodgson is also a speaker and author of 42 books, historical novels and novellas for adults and children’s books, including her popular Sinclair Sisters of Cripple Creek Series. Her children’s books include bestseller, Bedtime in the Southwest picture book and board book, Real Girls of the Bible: A 31-Day Devotional, The Princess Twins Collection, and many more. Mona’s writing credits also include several hundred articles, poems and short stories, which have appeared in 50 different publications. When Mona isn’t writing, she might be speaking for a women’s group, book club, school, or at a conference for writers and librarians. Or hanging out with family and friends. In April 1998, I graduated from Brigham Young University with a BFA in Illustration and have been freelancing ever since. I'm enjoying it throughly and am glad to be realizing my dream of becoming a freelance illustrator. In 2010 I added the title of AUTHOR to my resume when my first picture book completely created by me hit the shelves. From then on, my focus expanded to being the full creator of books from start to finish. I love the process and seeing my ideas come to life in words and art together. I've now published over 14 picture books and have many more in my head.